You’re a writer? Cool. Let’s write lists. 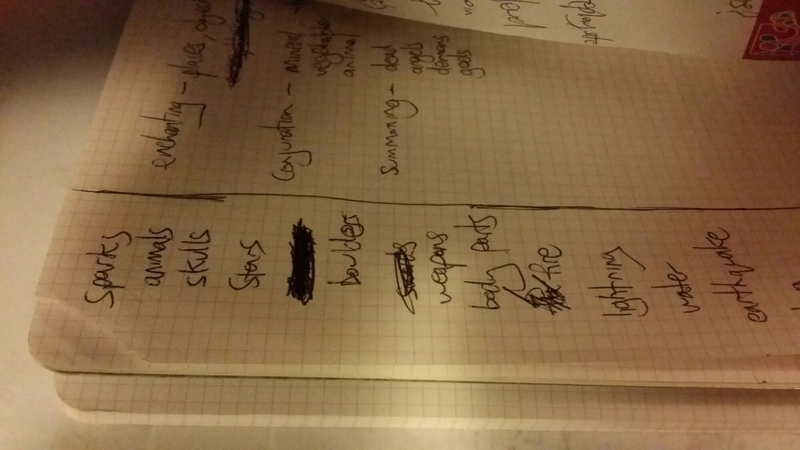 It occurred to me the other day: back when I started writing in the early nineties, I wrote uber-lists. These lists added novelty to my writes. A protagonist from the first story I ever typed (gothic font, pop-art a-plenty) rode a quad-bike. At seven years old I already knew. Luckily, they fit perfectly with the way we take notes as authors. Hear me out: you have a broccoli-related brainwave while slugging back cocoa in your jimmy-jams, so you grab a notebook and jot that thought-nugget down. But where does it end up? Lost amid a thousand disparate ideas. But what if you had lists? Tens of lists? Hundreds of lists? You go to your green veg list and there it is! So from tonight, I start lists again. Only they’re grown-up lists: Character flaws. Interesting verbs. Fun phrases. Things people do. I’m in good company. Robert Rodriguez, director, cinematographer, and writer of Planet Terror and Desperado, makes awesome films cheap. Rather than forty guys working CG and a scale Titanic re-construction, he wrote a list of the awesome stuff he already had access to. Cars, nuns, guns, zombie goo (chipotle sauce), and so on. Can you think of a list you need to start writing? Or you know of one, like this list of 1000 awesome things? Let me know. This entry was posted in Writing and tagged books, Lists, Notes, Planning, Robert Rodriguez, Writing. Bookmark the permalink. 6 Responses to You’re a writer? Cool. Let’s write lists. I haven’t written lists, but I have written plot lines often that felt like a list (a bucket list for the characters, in a way). If I were to write a list, it would be unusual character names I gathered from encyclopedias and plaques on walls. Do you find that you get to use most things in your list? Sometimes my listed items branch out and become a mind map of scenes. Oh, and to answer your question: I haven’t really used lists until now, but it’s something I want to start doing. I have been using lots of internet research looking for specific things, and I noticed that lists often feature in that research (lists of Sikh weapons actually comes to mind, as did the abovementioned list of 1000 awesome things). Cool idea! Maybe this’ll finally get me to organize my piles of storyscat.